This is the best small crossover for you if you believe it’s possible to get a second chance to make a first impression. EcoSport (pronounced ECHO-Sport) is Ford’s entry in the increasingly popular subcompact-crossover market. It debuted in North America for the 2018 model year with some unique features that help it stand out in a crowded competitive set. Among them is the segment’s only three-cylinder engine, all-wheel drive (AWD) availability on even the base model, and a rear cargo door that opens to the side rather than lifting. Competing against a tough field led in sales by the Subaru Crosstrek, Jeep Renegade, Honda HR-V, and Chevrolet Trax, this little five-seater is a prime example why it’s best to really scrutinize a vehicle before making a purchase. Our initial exposure was a brief, manufacturer-sponsored test drive. The impression was not positive, with the EcoSport coming across as rather unrefined. Testing one for our standard weeklong evaluation period improved our view, however. It has its faults — you’ll read about them below — but the EcoSport is worth considering, especially since Ford is offering some very enticing purchase incentives. There’s little reason to wait. The next major update for this diminutive wagon is unlikely before model-year 2022. What form it’ll take is far from settled. So if a tiny affordable Ford with good mileage and available AWD interests you, a discounted 2019 EcoSport is a good bet. It’ll carry over virtually unchanged for model-year 2020, but almost certainly suffer some price increase. Today’s U.S.-market EcoSport is the facelifted second-generation model that went on sale in other countries in 2017. The third-generation model may use a variant of the automaker’s Global B-Car Platform, which underpins the European-market Ford Fiesta. Its styling could resemble a sleeker version of the current-generation Escape compact-class crossover. Alternately, a replacement could come before model-year 2022 if Ford elects to rebadge its Chinese-market Territory crossover for export to North America. This four-door five-seater is notably larger than the current EcoSport yet smaller than the current Escape. This could be less costly up front for Ford, allowing it to be in-market with a more competitive product more quickly. Given the tenuous state of U.S.-China trade relations as of late 2018, however, the company may not want risk bringing such a vehicle stateside. The 2019 EcoSport is a virtual rerun of the 2018, with minor updates to feature packaging and addition of the SES Black Appearance Package. The lineup consists of the base S model, the volume-selling SE, the sport-themed SES, and top-line Titanium. S, SE, and Titanium come standard with front-wheel drive and a turbocharged three-cylinder engine. Optional on those models and standard on the SES is traction-aiding AWD and a naturally aspirated four-cylinder engine. A six-speed automatic is the sole transmission. Styling: EcoSport is basically a miniaturized Escape styled toward the conservative side of the subcompact-crossover spectrum. It’s got the shortest wheelbase (the distance between front and rear axles) in the class, and one of the shortest bodies, too. But it’s relatively tall. The result is a stubby look less graceful than the Mazda CX-3 and less rugged than the Renegade. At the same time, it livelier looking than the HR-V without the over-styled angles of the Toyota C-HR. SES grades have a slightly lowered sport suspension with grille, lower body trim, and wheels getting the trendy blackout treatment. The new Black Appearance Package adds a black roof and hood decal to complement specific exterior paint colors. Comfort is good for front-seat occupants. Be sure to critically evaluate the driving position; some might find it a little awkward. The front buckets in our SES review sample seemed more aggressively bolstered than in most other subcompact crossovers and might feel confining if you’re of greater than average girth. Instrumentation is straightforward, with the multi-function display offering a wide variety of helpful data. S grades have a tiny 4.2-inch infotainment screen. The SE gets a 7-inch unit with Ford’s Sync 3 interface and support for Apple CarPlay and Google Android Auto. Optional on the SE and standard on the SES and Titanium is an 8-inch unit that adds imbedded GPS navigation. The infotainment system is intuitive to operate and falls easily to hand. The climate controls are similarly straightforward but are mounted a bit too low on the central dashboard stack, requiring a longer look away from the road than we would like. That short wheelbase takes its toll on back-seat room and comfort. Ford claims a class-competitive 36.7 inches of legroom, but in practice it feels much tighter than that. A 5-foot-8-inch adult is very cramped behind a front-seat passenger of similar height. Cargo capacity is fine for the segment, at 20.9 cubic feet behind the rear seatbacks and 50.0 with them folded. Hinged on the right, the cargo door opens away from the curb, which might be advantageous in urban environments. But it’s heavy and awkward to shut. Handy under-floor storage with an adjustable shelf and nicely sized door pockets are appreciated, though the glovebox and center-console armrest don’t provide much storage space. Mechanical: Front-wheel-drive EcoSports use a 1.0-liter three-cylinder from Ford’s EcoBoost (E-co Boost) engine family. With just 123 horsepower and 125 pound-feet of torque they’re not what you’d call fast, but you may be surprised how well these EcoSports move. The six-speed automatic transmission is a good match for this engine. Opting for AWD replaces the three-cylinder with a 2.0-liter four-cylinder that isn’t turbocharged. Its 166 horsepower and 149 pound-feet of torque is sadly not enough to overcome a weight penalty of nearly 300 pounds versus the front-drive models. And here the six-speed automatic feels what we’ll charitably call “uncooperative.” Our SES test example suffered slurred shifts and noticeable delays in response to throttle inputs. The available Sport mode and steering-wheel paddle shifters helped somewhat. Whatever Ford chooses for the next-generation EcoSport we hope it’ll offer a variant of the excellent 1.5-liter turbocharged four-cylinder available in the Escape. EcoSport’s brief wheelbase — at just 99.2 inches, the shortest in the class by nearly an inch and a half – contributes to a ride plagued by hobby-horse pitching and unwanted secondary motions over pockmarked roads. It’s livable in the S, SE, and Titanium. But the more tautly tuned SES borders on uncomfortable. Worse, the extra firmness doesn’t result in a measurable benefit to handling. Though they lack the AWD versions’ extra margin of slippery-surface traction – and their independent rear suspension — the lighter three-cylinder EcoSports are more fun to toss around corners and nimbler in tight urban spaces. Features: A rearview camera is standard and rear-obstacle detection is available. But the 2019 EcoSport lacks key safety features available on every one of its rivals. Principal among these is autonomous emergency braking designed to automatically stop the vehicle to mitigate a frontal collision. Along with such driver assists as adaptive cruise control and blind-spot warning, EcoSport buyers probably won’t be offered these assists until the next-generation model. 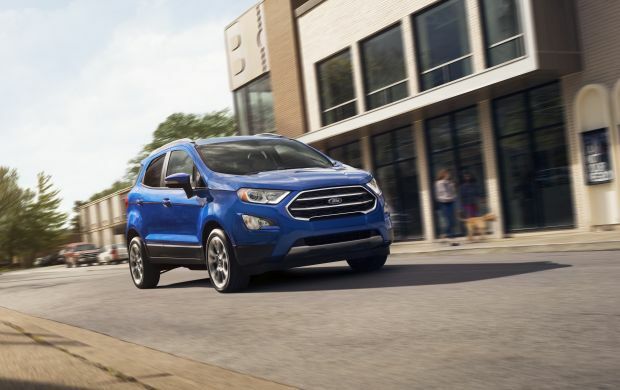 The ’19 EcoSport S grade is basic but includes a few nice features, such as 16-inch aluminum wheels, an acoustic laminated windshield, capless fuel filler, and dual USB and 12-volt power points. Most buyers will want to start with the SE, which adds a power sunroof, keyless entry with pushbutton engine start, rear-obstacle detection, upgraded cloth upholstery with heated front seats and power driver’s seat, automatic climate control, and Sync 3 with 7-inch infotainment screen. SES buyers get 17-inch wheels, sport suspension, heated steering wheel, imbedded GPS mapping with 8-inch display, built-in 4G LTE/Wi-Fi hotspot connectivity, Ford Connect telematics, blind-spot alert with rear cross-traffic detection, rain-sensing windshield wipers, and ambient interior lighting. Titanium versions lose the sport suspension but gain full leather upholstery, upgraded audio system, and chrome exterior and interior trim pieces. All 2019 grades except the S see modest base-price increases of $150-$395. Note that base prices we list include Ford’s $995 destination fee. With front-wheel drive and the three-cylinder engine, the S starts at $20,990, the SE at $24,145, and the Titanium at $27,155. AWD includes the four-cylinder engine and increases base prices to 22,585 on the S, $25,645 on the SE, and to $28,665 on the Titanium. The SES is AWD only and starts at $28,270. Factory options are limited. All grades offer extra cost paint colors for $395-$595. 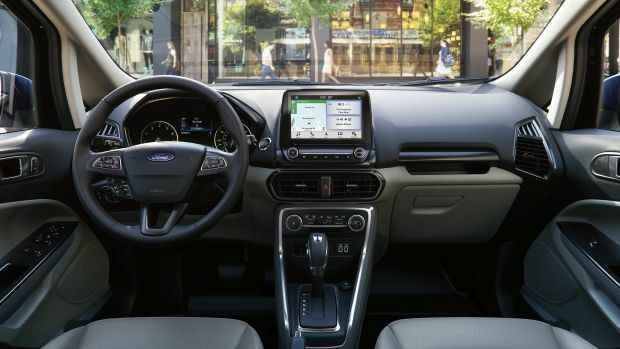 The SE has a $1,795 Convenience Package that adds imbedded navigation with 8-inch touchscreen, Wi-Fi hotspot, Ford Connect, and blind-spot alert with rear cross-traffic detection. The SES Black Appearance Package is $395. Our pick for best value is the front-wheel-drive SE with no other options. Find a motivated dealer, and you might be able to drive one of these home for around $20,000, which is a more compelling value proposition than its $24,145 sticker price. EcoSport’s EPA ratings are below average for the class. Three-cylinder front-drive models rate 27/29/28 mpg city/highway/combined. AWD four-cylinder versions rate 23/29/25 mpg. Our test SES returned 25.6 mpg in our suburban test loop. All grades use regular-grade 87-octane gasoline. We’ll chalk up EcoSport’s hefty share of cool reviews in part to that limited-initial-exposure syndrome. But shoppers seem unenthused as well, and sales have been sluggish. We believe Ford will want to field a replacement EcoSport as soon as practical. Count on the next-generation model to be larger inside and out, with a more traditional liftgate replacing the current EcoSport’s side-opening cargo door. Three- and four-cylinder engine options should remain. Industry insiders suggest this will happen sometime in calendar 2021, which would probably mean a 2022 model.